It’s a cold and cloudy morning here at Sonia Sabri company! We can’t start the day here without a coffee… can anyone? Anyway, I’ve been hearing an intriguing sound through the office door for a few weeks now and needed an excuse to see what’s been going on recently in the studio. I very kindly offered to make the office some coffees and finally, I had the chance to step into the dance studio to flick the kettle on and… WOW! 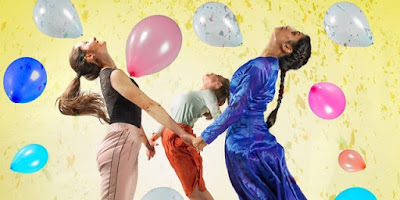 ‘Same Same…But Different’ is a new family show, bringing together Sue Buckmaster, artistic director of Theatre Rites and our very own Artistic Director Sonia Sabri. The show uses live music, spoken word, Kathak, contemporary dance and physical theatre to explore themes of identity, difference and belonging. The show will tour from February 2019 and is aimed at ages 5+ and their adults.